CEO Mike Jackson: "We had double digit increases in every part of our business ... It was our best performance ever." Strong year-end vehicle sales and improvements in all business categories pushed AutoNation Inc. to 12 percent gains in revenue and operating income in the fourth quarter from year-earlier levels, the company said today. The retailer’s net income rose at a slightly slower pace of 7 percent. 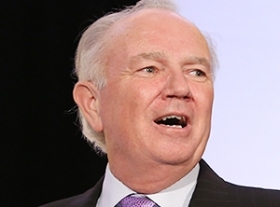 AutoNation reported net income of $116.7 million in the fourth quarter. The 2013 number was buoyed by gains related to property dispositions and income tax adjustments. Adjusted for those one-time events, fourth-quarter net income rose 15 percent in 2014. The nation’s largest dealership group said it was helped by a stronger performance in all areas of the business: new vehicles, used vehicles, parts and service and finance and insurance. Fourth-quarter operating income rose to $226.5 million, as revenue rose to $5.05 billion. "We had double digit increases in every part of our business," CEO Mike Jackson said during an interview on CNBC this morning. "It was our best performance ever." Jackson, noting AutoNation's January sales rose 20 percent to 23,355 new vehicles, also said the U.S. auto industry is on pace to top 17 million in sales this year. AutoNation also reported strong results for all of 2014. Full-year net income rose 12 percent to $418.7 million, and operating income rose 11 percent to $820.8 million, as revenues rose 9 percent to $19.11 billion. During the fourth quarter, AutoNation’s total unit volume rose 10 percent as the company retailed 82,549 new and 53,534 used vehicles. For the full year, total unit volume rose 7 percent with 318,008 new and 214,910 used vehicles retailed. On a same-store basis, new-vehicle sales rose 7 percent in 2014 to 311,128, vs. a 6 percent industrywide gain. The retailer’s same-store new-vehicle sales rose 9 percent in the fourth quarter, vs. a 7 percent gain for all U.S. light-vehicle sales. Also during the fourth quarter, AutoNation’s domestic-brand segment posted the sharpest gain in income -- 28 percent -- among the company’s three reporting units. Its import-brand segment was next with a 12 percent increase, followed by the luxury-brand segment with a 10 percent increase. AutoNation also said today that it had acquired a Mercedes-Benz store in Reno, Nev., last month and a Volkswagen store in metro Atlanta this month. The combined annual revenue for those stores is about $120 million. Those purchases follow the fourth-quarter acquisition of Mercedes-Benz, Audi, Porsche and Volvo stores in the Seattle and Bellevue, Wash., area with combined annual revenue of $355 million.